On a night when thousands of Paris residents and tourists were reveling and fans were enjoying a soccer match between France and world champion Germany, horror struck in an unprecedented manner. 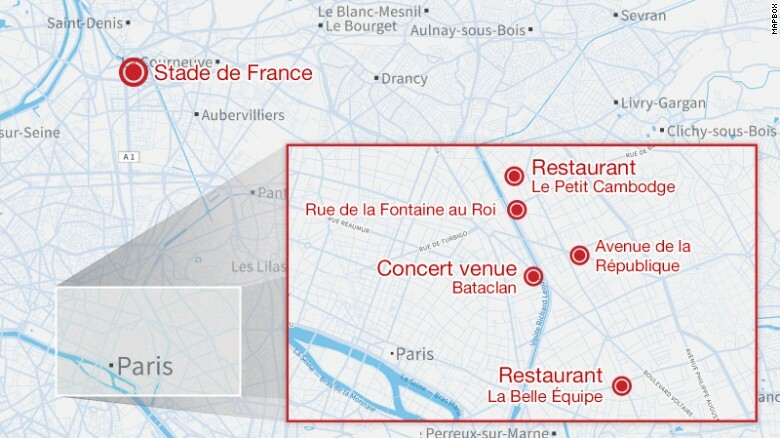 Terrorists -- some with AK-47s, some reportedly with bombs strapped to them -- attacked sites throughout the French capital and at the stadium where the soccer match was underway. • U.S. President Barack Obama spoke with French President Francois Hollande to offer condolences and assistance in the investigation, the White House said. Earlier, Obama said, "This is an attack not just on Paris, not just on the people on France, but an attack on all humanity and the universal values we share." He called the attacks an "outrageous attempt to terrorize innocent civilians." • Five suspected attackers have been "neutralized," said Molins. It was unclear whether that term meant the terrorists were dead. • A witness tells Radio France that attackers inside the Bataclan concert hall entered firing rifles and shouting "Allah akbar." • CNN affiliate BFMTV, citing French officials, said some gunmen were still at large. • Charlotte Brehaut and a friend were dining in Le Petit Cambodge, a Cambodian restaurant, when the shooting started from the street, she told CNN. "All of a sudden we heard huge gunshots and glass coming through the windows. We ducked with the other diners," she said. She grabbed the arm of a woman on the floor. The woman didn't respond. The woman was shot in the chest and there was blood all around her. At least 14 people were killed in Le Petit Cambodge, authorities said. 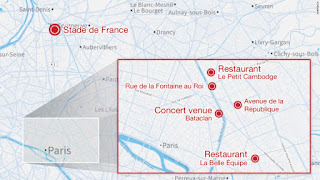 • Four attackers were killed, including three who were wearing explosives belts, at Bataclan during the police raid, Paris police spokesman Michel Cadot told France Info radio. • There is great alarm over the apparent methodology and likely planning that would have been needed to pull off such a series of attacks, one U.S. counterterrorism official told CNN. The attacks resembled tactics that have been used by a number of terror groups -- including al Qaeda's focus on mass casualties and visibility, and the small, tactical nature of attacks that are more the hallmark of ISIS and its acolytes. It is still not clear who is responsible.